Think oatmeal is boring? You shouldn’t. Not when it can be topped with deliciously sweet caramelized bananas and luxurious, rich dark chocolate. Wait what? Are we talking about dessert here? Nope. But we could be. In reality we’re talking about a heart healthy breakfast that only tastes like dessert. 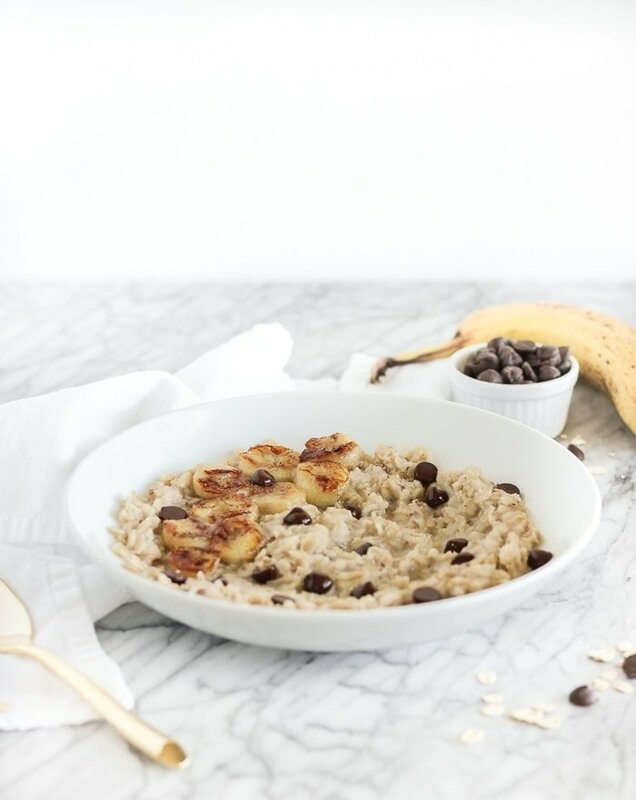 This delicious caramelized banana dark chocolate oatmeal is made with the humble but nutritious base of oatmeal, then dressed up with caramelized banana and dark chocolate chips for a breakfast treat that you’ll look forward to before you even get in bed the night before! Since Heart Month is coming to an end, I thought I’d better share one more heart healthy recipe with you all. 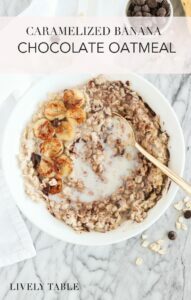 Oatmeal is a classic heart healthy food that sometimes gets a reputation for being boring and bland. In reality, it’s the perfect blank canvas for ALL the toppings! You can jazz it up with any fruit, nuts or spices you want, or go the savory route. The breakfast possibilities are endless. 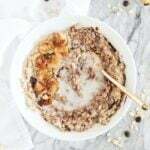 Aside from the fact that they can take on any flavor, oats are full of heart healthy fiber to keep you full for hours while also keeping your cholesterol in check. 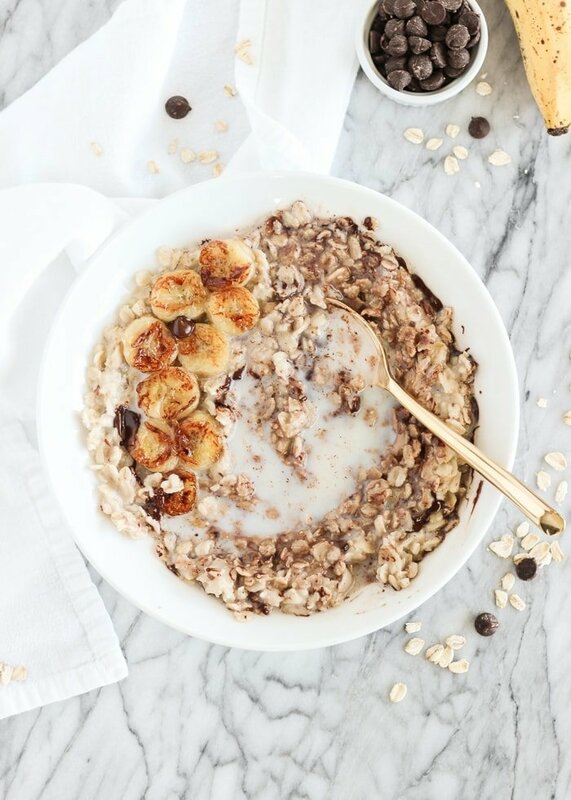 Yet another reason to add oatmeal to your breakfast routine. 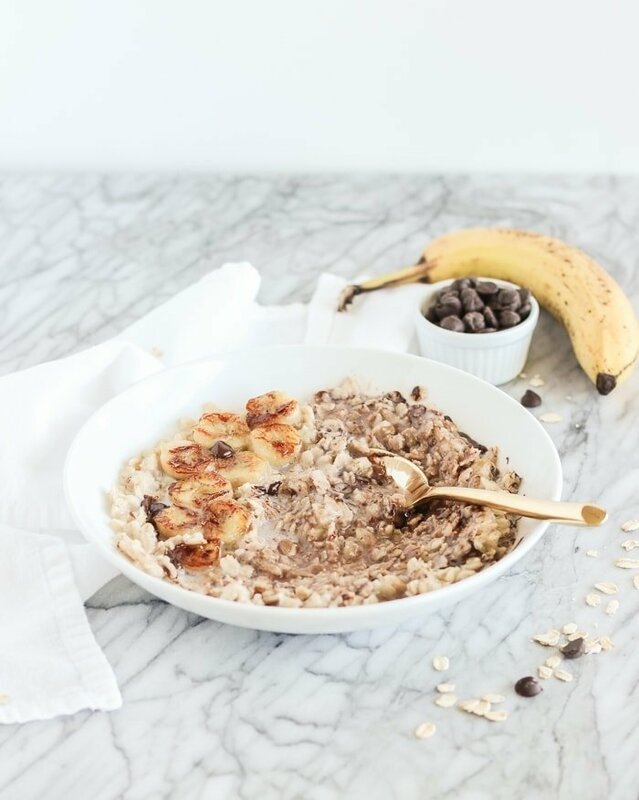 If you don’t eat breakfast, this recipe for caramelized banana dark chocolate oatmeal just might get you to start. It’s much easier than it sounds. 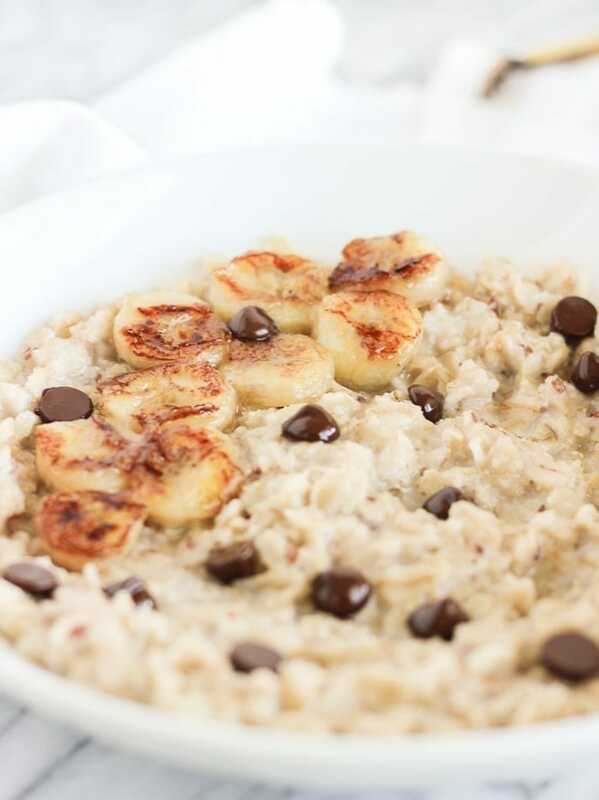 While the oatmeal cooks, just throw a few slices of banana into a nonstick skillet for a couple of minutes. Then stick those bad boys on top of your oatmeal with some chocolate chips and let it get all melty and delicious together. Really, that’s it! With a flavor this sweet and delicious, you’d think this recipe takes much longer. What are you having for breakfast tomorrow? Does it involve chocolate? I sure hope so! In a small saucepan, bring water to a boil. Stir in oats and reduce heat to low. Simmer until oats have absorbed all of the liquid, 3-5 minutes. While oats are cooking, spray a small non-stick skillet with olive oil. Add sliced bananas in a single layer and cook over medium heat until caramelized, about 3 minutes per side. 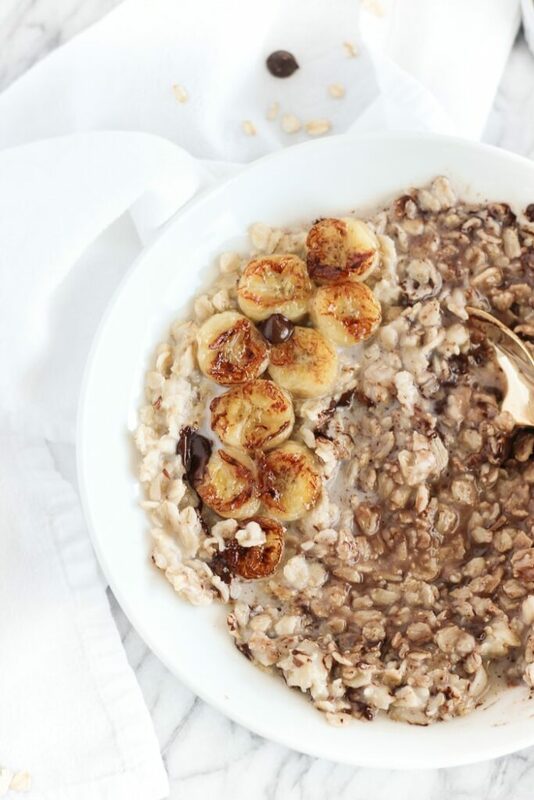 Spoon oatmeal into a bowl and top with caramelized bananas, and chocolate chips. Thanks Natalie, I’m glad you enjoyed it! The cinnamon sounds great!